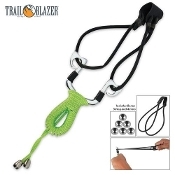 Trailblazer slingshots are designed for those who have a true passion for the outdoors. This Apocalypse backpack slingshot is no exception. Made of quality materials, rust proof, lightweight, and laser accurate. Included with the slingshot to get you started are 6 steel shot ammo balls.